A heaping helping of nachos is one of my (many) weaknesses. Probably due to those college nights after one too many vodka tonics on a mostly empty stomach because no one ever thought to serve actual food at the parties I went to (seriously what were they thinking?!). My roommates and I would get home and bust out the nachos as we recounted the night, gossiping like we were back in high school again. Of course those late night nachos weren’t anything like these nachos. Most of the time we were lucky to get anything more than chips, cheese and salsa on those nachos. 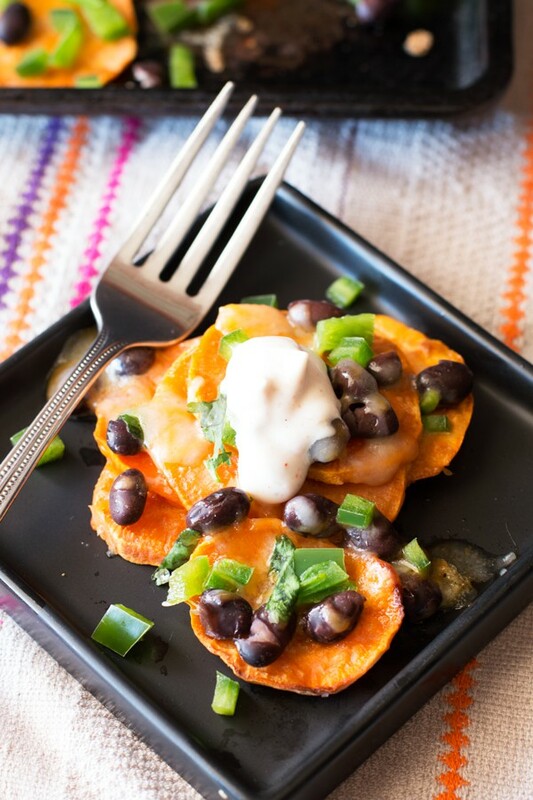 But these… oh my these sweet potato nachos are nothing like the ones we used to make. 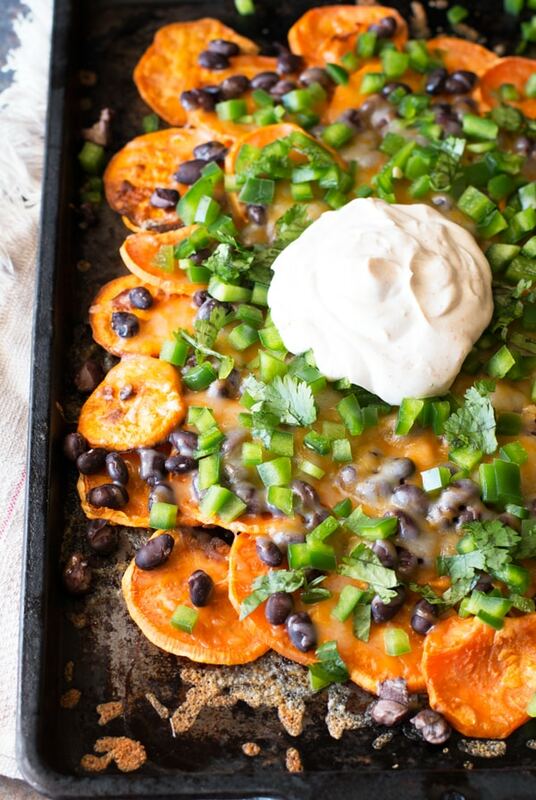 Just look at these sweet potatoes loaded with cheese, green pepper, jalapeño, and beans! All of this topped with a spicy sour cream that burns and cools your tongue all at the same time. 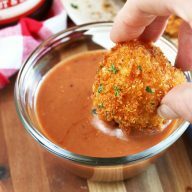 The extra bonus is that you’ll be saving calories with this recipe, but you won’t be sacrificing any flavor – trust me on this one. You will be keeping your New Year’s resolution to eat healthier, but it’ll still feel like you are giving into a guilty pleasure! 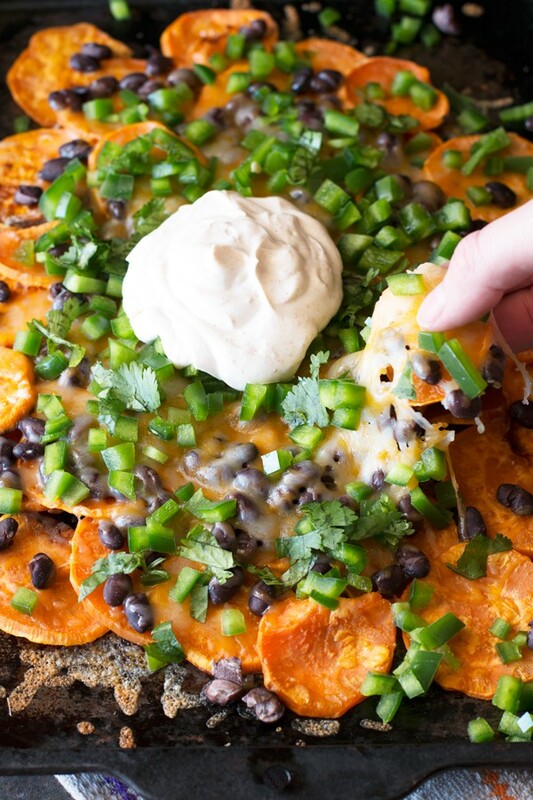 Roasted sweet potatoes are covered with all your favorite nacho toppings, creating a new healthy snack time favorite! 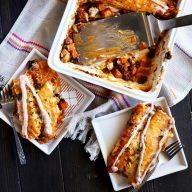 Spread out sweet potato rounds in one thin layer using two rimmed baking sheets. Drizzle sweet potato rounds with olive oil and season with salt and pepper. Roast in the oven for 20 minutes, flip the rounds over, and return to the oven for another 15 minutes. While the sweet potatoes are cooking, combine sour cream, cayenne pepper, and ground cumin in a small bowl. Set aside in the refrigerator until ready to serve. 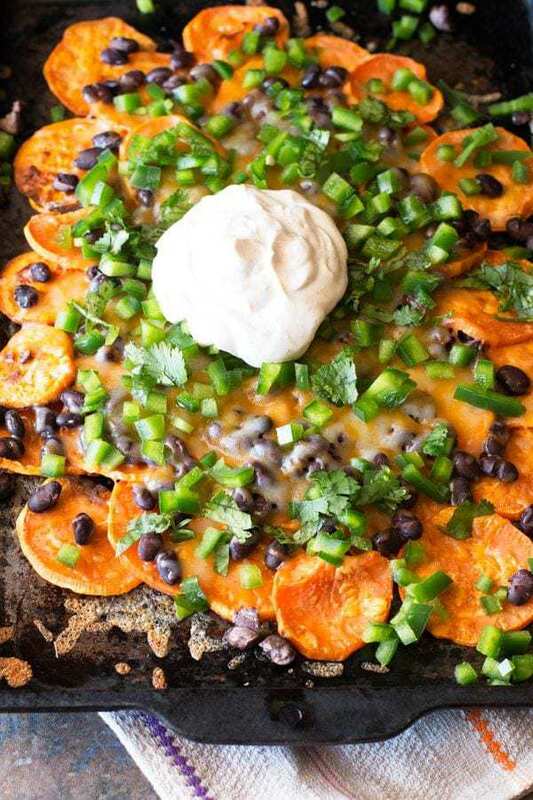 Pile the cooked sweet potato rounds on one baking sheet. Top with a layer of black beans and cover evenly with cheese. Place the baking sheet in the oven and cook until the cheese in melted, approximately 3-5 minutes. Remove from oven and cover with the diced green pepper, jalapeño, and chopped cilantro. Add the sour cream to the center of the nachos. Serve immediately. Great nacho idea! 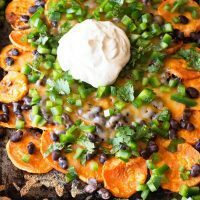 I miss eating nachos since I have been Paleo and this is a great substitute! 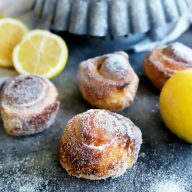 Thanks for the great idea and recipe!